When North Korea launched another missle earlier this month, President Trump said on twitter it’s hard to believe South Korea and Japan put up with this much longer. 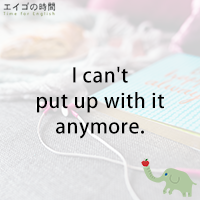 Today, we’re going to look at this phrasal verb to “put up with”. If you put up with something, you accept it without complaining, even though you don’t like it, even though you find it unpleasant or unsatisfactory. Here’s an example from the Cambridge dictionary: I can put up with the house being messy, but I hate it if it’s not clean. It’s okay, you can take it if the house is just messy. But you can’t stand it when it’s not clean. In other words, you can’t put up with a dirty house. It can be a person that you can or can’t put up with. For example, John is moody and lazy. I don’t know why you put up with him. I can’t put up with it anymore.